Gallia Academy sophomore Zach Loveday (32) blocks a shot during the second half of Saturday night’s OVC boys basketball contest against Portsmouth in Centenary, Ohio. CENTENARY, Ohio — Eight, most definitely, was not enough. 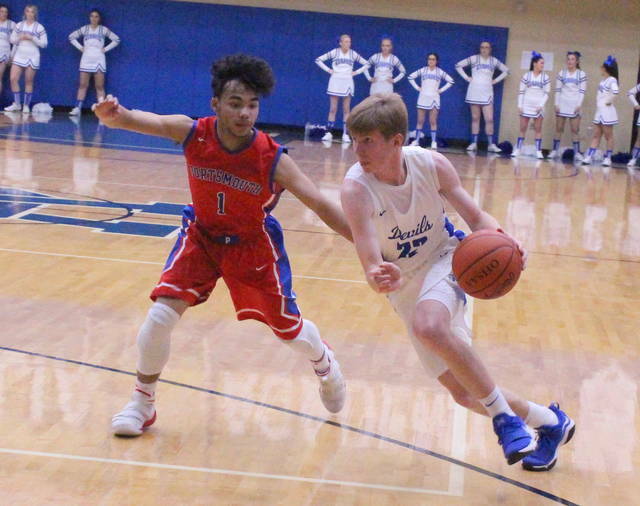 The Gallia Academy boys basketball team had nine different players reach the scoring column while picking up its ninth straight victory on Saturday night during a 76-50 decision over visiting Portsmouth in an Ohio Valley Conference contest in Gallia County. The Blue Devils (14-1, 8-1 OVC) shot 58 percent from the field and trailed all of 23 seconds in the contest as the hosts broke away from a 19-all tie after the first quarter and ultimately never looked back. The Blue and White opened the second canto with 12 consecutive points after hitting five of their first six shot attempts en route to a 31-19 edge with 4:33 left in the half, but the Trojans (9-5, 4-4) answered with four straight points over the next minute to close back to within eight. 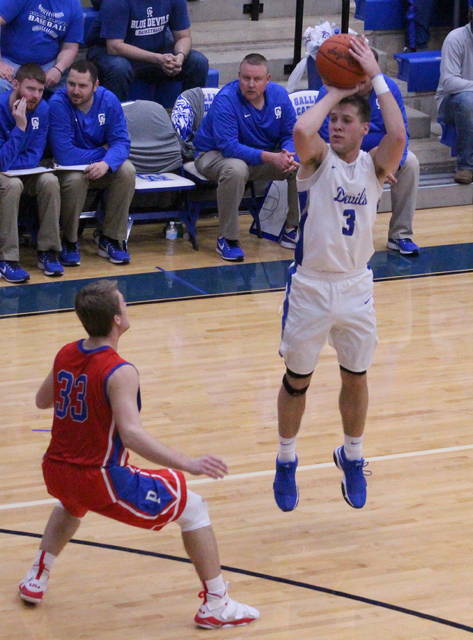 Gallia Academy, however, received five straight points from Evan Wiseman to close out the quarter, allowing the hosts to secure a 36-23 cushion headed into the break. GAHS hit 7-of-12 shot attempts during that key 17-4 second quarter surge, including all three of its trifecta attempts in that span. In fact, the hosts were a perfect 5-of-5 from behind the arc and shot 56 percent from the floor in the first half. PHS, conversely, missed its first five shot attempts and went just 1-of-10 from the field in the second canto. The Red and Blue were 9-of-24 shooting for 38 percent in the opening 16 minutes of play. After building leads of 7-0, 10-2 and 14-5 early in the first period, Portsmouth’s quickness starting giving the hosts fits over the final three minutes of the opener — which allowed PHS to rally back and take a brief 17-16 cushion before both teams ended up deadlocked at 19-all. 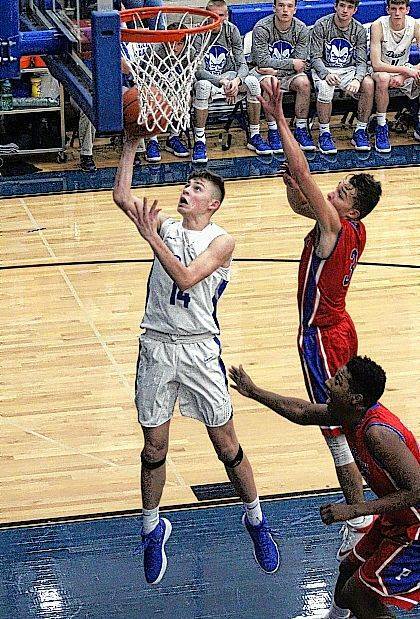 The Blue Devils switched their defensive approach in between quarters, going to a zone that forced the Trojans to penetrate and kick to outside shooters — except for the occasional challenge they faced when attacking 7-foot center Zach Loveday underneath the basket. GAHS coach Gary Harrison found some real success with that strategic move … and rode it the rest of the night. The Trojans made a small 6-4 run to start the second half, cutting their deficit down to 40-29 with 5:30 left in the third period. The guests, however, were never closer the rest of the way. 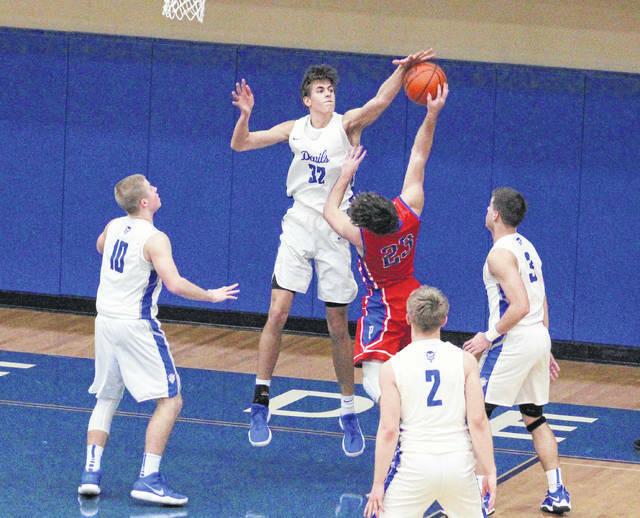 Gallia Academy reeled off 11 straight points over the next three minutes as part of an 18-4 charge to close out the canto with a 58-33 advantage headed into the finale. The Blue Devils took their largest lead of the night following a basket by Logan Blouir that made it 66-36 with 5:38 remaining in regulation. Portsmouth ended the game on a small 14-10 run to wrap up the final 26-point outcome. Gallia Academy outrebounded the guests by a 31-21 overall margin, including an 8-5 edge on the offensive glass. The hosts also committed only eight of the 19 turnovers in the contest. Besides hitting 32-of-55 shot attempts overall, the Blue Devils were also 8-of-14 from three-point territory for 57 percent. Portsmouth, on the other hand, netted 18-of-47 field goal attempts for 38 percent, including a 9-of-24 effort from behind the arc for 38 percent. With an offense firing on all cylinders and a defense that was its traditional stingy self, Harrison acknowledged that he felt like his team was growing in front of his very eyes. Needless to say, the fifth-year mentor was pretty pleased with what he witnessed. Loveday led the hosts with a double-double effort 15 points and 12 rebounds to go along with three blocks, followed by Wiseman with 14 points and Justin McClelland with 12 markers. Logan Blouir also reached double figures with 11 points. Cory Call was next with nine points, while Caleb Henry and Kaden Thomas respectively chipped in six and four points. Cole Davis and Ben Cox completed the winning tally with three and two points, respectively. Call and McClelland respectively hauled in six and four caroms for the Blue Devils, who went 4-of-8 at the free throw line for 50 percent. A.J. Eloy paced the Trojans with 13 points, followed by Daniel Jordan with 11 points and Danny Lattimore with 10 markers. Matthew Fraulini and Isaac Kelly also contributed six points apiece in the setback. Myguel McKinkley and Reise Johnson completed the PHS tally with two points each. The guests were 5-of-10 at the free throw line for 50 percent. Kelly led Portsmouth with seven boards and Johnson also hauled in six rebounds. Gallia Academy returns to action Tuesday when it travels to Coal Grove for an OVC contest at 7 p.m.